Sometimes kids are so sleepy in the morning, they even forget when it's their birthday. With these fun ideas, they'll remember right away and get the day started in a festive mood. These could work for any time of year and for any birthday. It could be especially thoughtful for children with summer birthdays since they won't celebrate in school. Place a helium balloon above your child's bed, so it's the first thing seen in the morning. Or, fill the room with dozens of helium balloons. You could also skip the helium and just cover the entire floor with colorful balloons. What a way to wake up. Cover the birthday kid's doorway with streamers or a happy birthday sign the child must walk through to get out of the bedroom. Line a path from the bed to the breakfast table with a red carpet (you can use disposable tablecloths to make this). Decorate the house for the birthday party while the child is sleeping. Hang a birthday banner in the birthday kid's room. Decorate the front yard or porch in a festive way. You could stick signs in the grass or spell out happy birthday with rocks. If it's a winter birthday, draw a message in the snow. Decorate the car with streamers and signs, kind of like a "Just Married" car, but with birthday messages instead (like "Just Born! 10 years ago!"). Hang a happy birthday sign on the outside of your child's bedroom window facing in, so when the child opens the blinds or curtains, it's the first thing seen. Place a birthday message on the bathroom mirror or underneath the toilet seat lid. Have your child's favorite breakfast cooking. 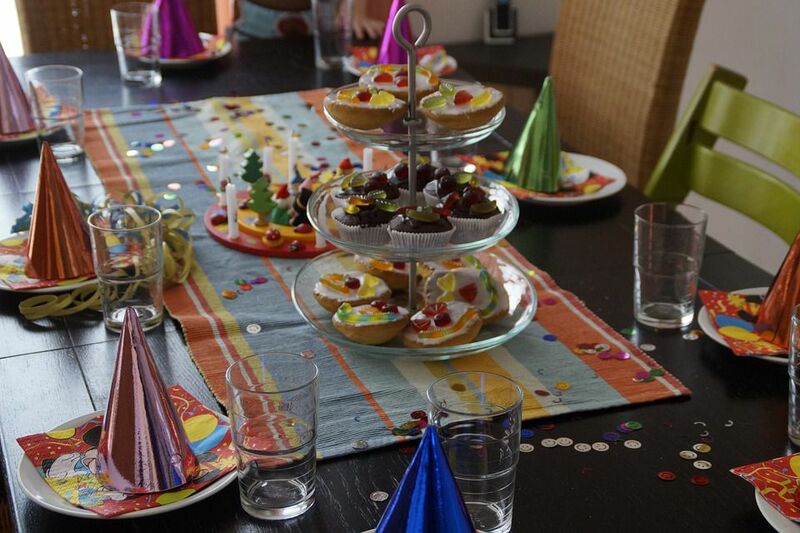 Set the breakfast table with party hats that everyone will wear during the meal. Serve a breakfast muffin, waffles, or pancakes with a candle on top. Or, serve birthday cake for breakfast. Take the birthday kid out for breakfast. Invite a few best friends over for a surprise breakfast party. Have them sitting at the table, waiting to yell "surprise!" when your child comes into the kitchen. Make a shirt that says "It's my birthday!" Set it out so your child can wear it for the day and receive birthday wishes from everyone encountered. Place a wrapped present next to the pillow or on the floor outside the bedroom door. Hand your child a clue when they wake up, setting the kid on a treasure hunt. Leave several clues around the house until your birthday kid reaches the final destination, where a present awaits. Play with the age your child is turning. If turning 5, for instance, make a pancake shaped like a number five, put paper handprints around the house and greet your kid with a high five in the morning. If turning 8, play a game of crazy eights over breakfast. For a seventh birthday, serve 7up with breakfast. Have a playlist of birthday-themed songs playing when the child wakes up. Print a larger-than-life picture of the birthday kid and hang it on a wall. You can even use this with a cutout slice of cake to play Pin the Cake on the birthday child's mouth.